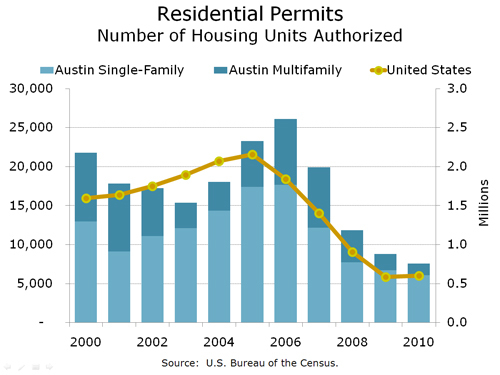 Huge spikes are clear in 2006 and 2007, but note the significant proportion of multifamily Austin permits in November and December 2010. I view that as a vote of confidence in Austin’s growth trajectory, and many economic and employment forecasts support that confidence. It is great to see the national trend in positive territory for all of 2010, but look at the slope of the Austin curve in the last half of the year. Over the past couple of years, permitting activity seems to match homebuyer tax incentive programs that ended in November 2009 and June 2010. 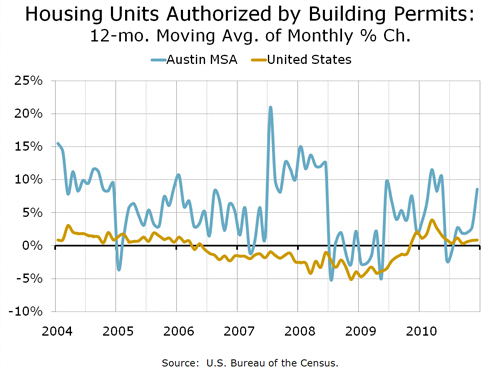 Even during the lowest ebb from mid-2008 to mid-2009, Austin remained relatively secure, but since then our market has shown positive year-to-year growth in permits for most of 20 months. The only exception was at the very end of last year’s tax credit program. Based on many other reports over the past year or so, it is not surprising that these top 10 markets include 4 Texas cities, and Austin is in good economic company with Houston and Raleigh, NC in the top 3. Austin’s success in creating companies and jobs, and in attracting corporate relocations, has been well reported. I have written many times on those subjects, and early this year I posted comments about the huge in-migration trend here (Still flocking to Texas …). 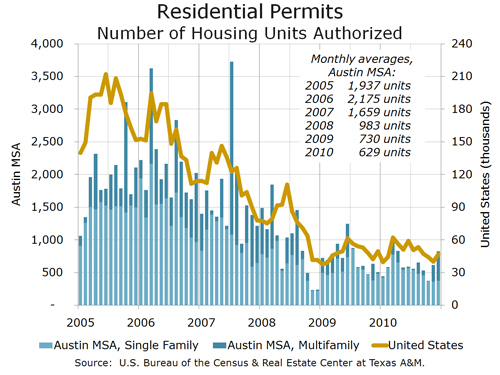 Just Monday I commented on rising apartment occupancy and rental rates in the Austin metro area — clearly a reason for interest in multifamily construction (Rents rising in Austin). I continue to see real interest among prospective home buyers, but with some hesitation. Many are confused by a multitude of news reports about the direction (or lack thereof) of the U.S. economy and housing sector. 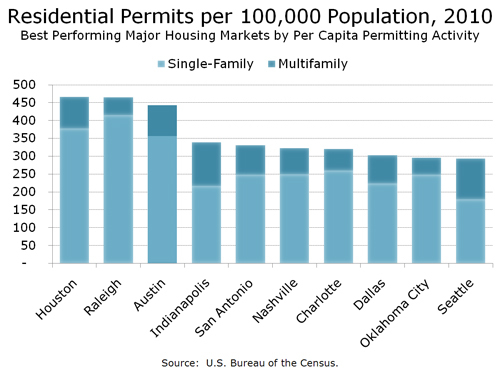 Others are in Austin because our entrepreneurial culture and job growth but must remain renters until they are able to sell homes in other, more troubled, cities. Continuing changes in the mortgage business also complicate the plans of many new Austinites. Mortgage qualification is generally more difficult than in previous years, but the prospect of rising interest rates is a motivating factor for those that can qualify. Moreover, unlike many places, it is entirely reasonable to expect rising home values in Austin in 2011 and 2012, so those who can, are moving to get into the market sooner rather than later. I have no doubt that new multifamily/rental capacity will be largely absorbed this year and next. I am also confident that as home sales in California, Arizona, Nevada, and Florida recover, we will see acceleration of sales in Austin. In the short run, we will likely see a shortage of platted lots for new homes in the Austin area, which will help with resale values. As I have noted elsewhere, foreclosure activity in Austin has been very subdued relative to the five states where the recession hit hardest, and while there will be more distressed properties than usual on the market here for the next couple of years we don’t have the magnitude of “shadow inventory” that many other cities anticipate. I agree that we are in a transitional market and that it remains unpredictable. That’s why I usually check with McGraw Hill’s Texas Construction site to learn more about building issues. building construction I like your positive attitude, especially about expecting rising home values in Austin in 2011 and 2012. I occasionally work with McGraw Hill, and if you want to stay current on Texas construction news, I highly recommend that you check out their website. Janice, thank you for your comment and recommendation. Great look into the current state of the market, one that you feel is in a transitional state (I’ll take your word for it) and like many other states we can only hope for the building/home industry to rebound sometime in the near future. I completely agree that there are buyers who are out there willing to buy but are somewhat hesitant. I find myself getting similar news and ideas regarding texas building construction on the McGraw Hill Network, the same site that was mentioned above by another poster. It really is a great hub for all things building. Rich, thanks for your comments. I spent a good part of this week with a couple that plans to move to Austin this year, mostly introducing them to builders and new home communities that match their needs. Everywhere we went we saw new activity and excitement that I did not see in that part of the real estate business last year. Obviously, that is anecdotal and very localized, but encouraging nonetheless.